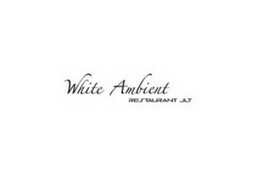 White Ambient Restaurant is currently closed for delivery and it will open at 11:00 AM today . Side, mix salad & dessert. 600gm, side, mix salad & dessert. soup, mix salad & dessert. With 4 cheese white sauce, soup, mix salad & dessert. Served with belgium fries & green salad, soup, mix salad & dessert. 5 pcs, soup, mix salad & dessert. 7 pcs, soup, mix salad & dessert. Main course , soup , green salad , dessert of the day. Served with mash potato or pasta with garlic bread & green salad. Choice Of Spinach Or Tomato or Mozzarella tortellini, Turkey Salami or vegetable Topped Up With Cheese Cream, Garlic Bread & Green Salad. Served with pita bread, tzatziki sauce, Belgium fries, mix salad & soft drink 250ml. Thin crust pizza based with turkey strip, cream fresh, onion, tomatoes & herbs. Served with Belgium fries or potato salad & mix vegetable salad. 250 gms Angus steak, served with Belgium fries or potato salad or mash potato & garlic bread. Served with belgium fries or salad. Preparation time 30 to 45 mins. Carrot, orange, mix berries, kiwi & peaches. Kiwi, orange, ginger & mint. Orange, carrot, ginger & mint. Orange, carrot, pear & apple. Prepared with potato, onion, cucumber, parsley, apple and egg. Prepared with lettuce, carrot, tomato, cucumber, onion, with capsicum. Prepared with Lettuce, anchives sause, carrot tomato, krotton, boil egg, with chicken strip. Prepared with Tomato, capsicum, cucumber, olives, onion, fettacheese with carrot. Prepared with Pasta, potato, onion, tomato, cucumber, capsicum, olives, beans with cheese.